Fiorentini + Baker celebrated its 10th anniversary on November 3rd with a limited edition launch of its most iconic boot, the Eternity Three Buckle (retailing for $700) at their flagship store at 54 Mercer Street in SoHo. The 10th anniversary is also marked by the launch of Fiorentini + Baker Junior, its first children's line, featuring pint-sized versions of its most iconic looks. During the party, Fiorentini + Baker unveiled Prometheus Lives, an art exhibition by famed Italian artist, Sergio Pappalettera. 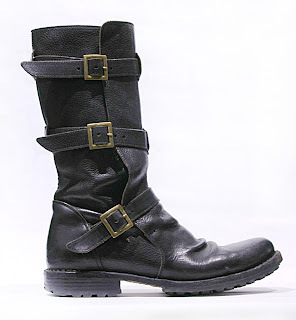 Some of my favorite Fiorentini + Baker women's boots for Fall/Winter 2011-2012 include Ava, Berni, Nola, Nuria, Billie and Mint.